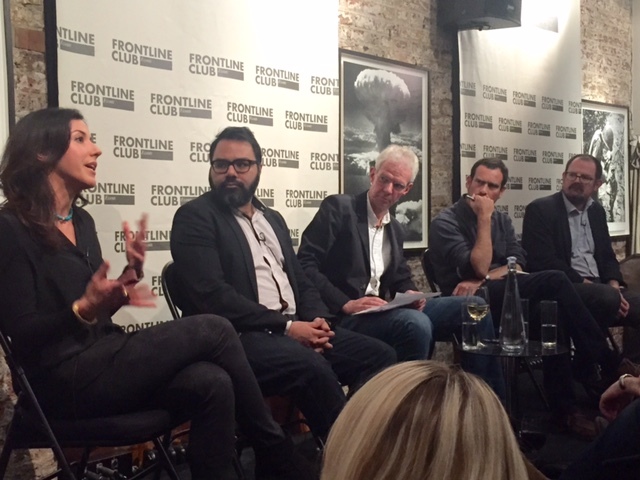 A panel discussion focused on The Fight Against Daesh made for a timely first First Wednesday of the year at the Frontline Club. The packed event on 6 January was chaired by David Loyn, foreign correspondent for the BBC for over 30 years. The speakers included Richard Spencer, Middle East editor of The Daily and Sunday Telegraph; Shiraz Maher, research fellow at the International Centre for the Study of Radicalisation at King’s College; and Robin Yassin-Kassab, journalist and author of The Road From Damascus and most recently co-author with Leila al-Shami of Burning Country: Syrians in Revolution and War. Completing the panel was Azadeh Moaveni, lecturer in journalism at Kingston University and former Middle East correspondent for TIME magazine, and author of Lipstick Jihad and Honeymoon in Tehran. From the outset, the panel approached discussions on Daesh with a thorough evaluation of the developments in Syria and surrounding region. The discussion took a turn away from the media hype surrounding Daesh towards the geo-political realities and factions at play. From Islamist and moderate groups within Syria to Saudi Arabia, Iran, the Western allies and Turkey, few stones were left unturned. Jabhat al-Nusra, the Al-Qaeda affiliate operating in Syria, was discussed at some length. The panelists agreed that, unlike Daesh, Jabhat al-Nusra’s more tolerant and classical grassroots approach would remain deeply embedded in Syrian society in the longterm. It was also agreed that Al-Qaeda more generally has had to reassess its tactical boundaries in order to distance itself from the relentless barbarianism of Daesh.